Now that is one statement (or observation) – that is going to last as long as vehicular pollution remains – that means eternity – going by the present state of affairs the human civilization has. During arguments on pleas of some vehicle makers, the Supreme Court remarked so yesterday – and it was such a delight to ears. After all, we live in a society where the term ‘VIP’ has become a cultural phenomenon – so much so – that no one bothers what its expanded form means. I am sure there would be countless who would not be knowing what the term ‘VIP’ expand to – but they profoundly know what does it mean. Bigger vehicles are notorious the world over and most environment sensitive regimes have started rejecting them – using a slapstick quip for them – gas guzzlers. It is in the next price-slab, i.e., Rs. 5 to 15 Lakh, that people have fast moved to diesel vehicles with every maker, including even Honda (famed for its petrol engines), launching its diesel variants. The reasons vary – but the basic thing is the higher fuel economy as claimed by the vehicle makers as compared to petrol vehicles – and the relative lower retail price of diesel. And the trend has been severe in metros like Delhi – with more higher income groups – or long distances to cover in your daily life. Yes, but they all are polluting our environment as the experts say – as the court has rightly said the automakers to prove with documentary evidence that how their vehicles are less polluting or at par with petrol vehicles. And it is a most welcome observation by the Supreme Court – with another possibility that in future the top court may include all diesel vehicles being registered in Delhi and NCR. In addition, the USGS is also showing two tremors in Afghanistan and one in China, in line with the news reports of tremors in China and Afghanistan. Two tremors that the USGS classifies as significant are in Nepal. Here, the IMD and the USGS are on the same page on intensity of the aftershocks/earthquakes and but they differ on their depths. The IMD says every tremor of the day in Nepal had a depth of 10 Kms whereas the USGS data varies on the same – 10 Kms for some, 15 for some. And most significantly, it differs in case of the strongest tremor of the day, i.e., the one having intensity of 7.3. Nepal was still reeling under the aftermath of April 25 earthquake and its continued aftershocks when a strong tremor measuring 7.3, according to the India Meteorological Department and US Geological Department, again hit the Himalayan nation. First assessment by the USGS found it to be 7.1 in magnitude that was later revised. It was earlier reported as an earthquake but the geological experts later on said that it was an aftershock of April 25 earthquake and not a fresh one. Even if it was an aftershock, it was, so far, the most damaging and the strongest one after the earthquake of April 25. So, Nepal has felt over 16 tremors today if we go by the IMD and 12 if we go figures available with the USGS. According to the USGS, two were in Afghanistan and one in China. The strongest one, of 7.3, was near Kodari. It was 15 Kms deep, as the USGS finds it. (The Indian Meteorological Organization’s report says it was 10 Kms deep). The quake epicentre was near Mount Everest base camp near Nepal-China border. Based on the reports so far, the epicentre was 83 Kms from Kathmandu, 68 Kms from Namche Bazaar and 22 Kms from Zham in China’s Tibet. Though not high on death-toll so far, the quake epicentre has suffered extensive damage in the earthquake. Physical structures are flattened out and there is wide-scale destruction. Yes it is not going to be as damaging as the one on April 25, strongest one in Nepal in 81 years after 1934, but it is sure to worsen the situation there. Though expected to be much larger, the death toll from the April 25 quake still hovers around 8100 and the injured count is around 18000. Among other things, it also tells us about slow pace of reconnaissance and rehabilitation. In today’s earthquake, so far, Nepal has reported 42 deaths and around 1100 injured. More rubble is added by falling buildings. Aid teams are slowly reaching the remote parts. April 25 earthquake impeded flow of man, machine and materials. Roads were gone in many areas. Many brides were badly damaged. Phone lines were not working. Nepal was working slowly, with help of different aid teams, from its own people and from the international community, to restore the order. But the tremor today would certainly affect things negatively. Buildings, already damaged by April 25 earthquake have collapsed by May 12 earthquake. There are reports on this line from Kathmandu, Lalitpur, Patan, Bhaktapur and different areas of Nepal. Today’s earthquake is expected to add significantly to the 600,000 houses left uninhabitable and around 200,000 completely decimated. Like April 25 earthquake, India has been affected by this earthquake as well, though to a smaller extent. So far, India has reported 17 deaths with 16 from Bihar (and the figure has remained static over some hours). Like the last time, Bihar has again suffered the maximum damage in India. Overall, the quake was felt in many parts of North and Eastern India including Delhi. Schools are closed in Bihar and Uttar Pradesh. Bihar’s chief minister has said to arrange for the people who choose to stay outdoors. A strong earthquake of this extent would further add to the trauma of the residents of Nepal. Most of the victims are still living in camps and their plans will see a further delay if they had, at all, made up their mind to go back to their homes. The whole focus was bringing normalcy to Kathmandu and other quake affected areas but they are expected to run longer as refugee camps and ghost towns with the latest earthquake as the experts are predicting continued aftershocks. People looking for what is left in their houses in April 25 earthquake, people returning to their houses somehow after necessary repair (or even if no repair was needed), people living in refugee camps, people recovering in make-shift and other hospitals, people waiting for relief to reach them, and people engaged in relief operations – they all are possible victims of today’s strong tremors. Strong tremor today has added to the trauma of the earthquake victims. Panic was clearly visible on Nepal’s streets. Aid workers and people of different remote areas are further isolated. The 7.3 tremor today jammed traffic, choked communication lines and brought down the power lines. Kathamandu’s Tibhuvan International Airport, Nepal’s only international airport, that was closed due to April 25 earthquake and had to be closed again as its main runway had suffered cracks with landing of larger jetliners while the airport was equipped with medium sized jets only, was temporarily closed again today. India sent an MI-17 helicopter in the quake aftermath today to carry out assessment work to offer help. India established its quake-helplines and assured Nepal any help needed. Though Nepal has tried to iron out its bureaucratic, administrative and government lapses in the aftermath, the Nepali government is accused by its people of delay in rescue, relief and reconnaissance operations. When the April 25 quake happened, Nepal took some days to lift taxes on the aid material. It had to close its Tribhuvan airport as it could not handle the aid material. It stopped many large aircrafts with air material to land. Britain is still negotiating with Nepal to land its military helicopters there to assist the relief operations. Greenpeace campaigners may be green activists, but for Government of India, if we go by the developments, they are anti-development. 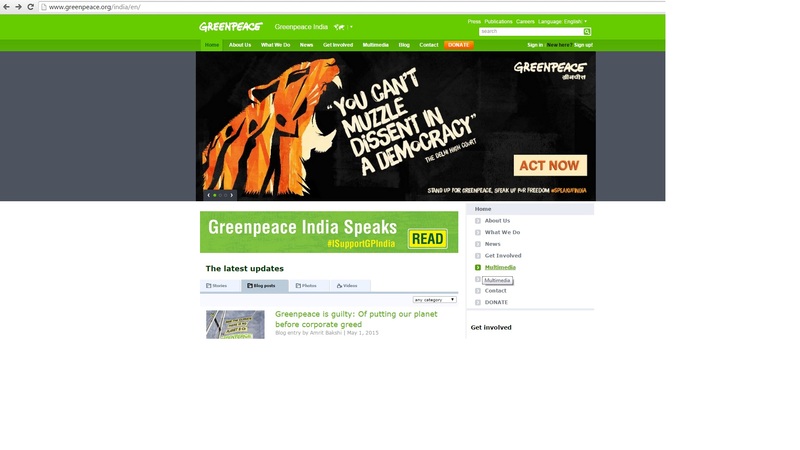 According to reports, Greenpeace India will be forced to close its operations within a month after the government froze its accounts almost a month ago. And if it happens so, it will be bad, not only for its over 300 employees, but also for environmental activism (or green activism). And if it happens so, it will be a first for Greenpeace, the global not-for-profit – the forced closure in a country of its operation. According to Greenpeace India chief Samit Aich, the organization, with funds available, can sustain itself for a maximum one month and a shutdown is imminent. The press release from the organization appealed to fight back the Ministry of Home Affairs (MHA) decision to block Greenpeace India funds, 68% of which, it claims, came from 77000 Indians. Greenpeace is sure going to challenge it in a court, like it has done it in the past. And it is expected to emerge as a winner, like it emerged in Priya Pillai case. She had moved to the court after being offloaded from a London flight this January. Indian government found her a threat to the country who was going abroad to testify against the government. The Delhi High Court was stinging in its remarks while absolving Priya Pillai this March. The court ordered the government to allow her to travel abroad and remove her from the ‘banned list’. The court also ordered the government to expunge the remark related to her ‘offloading’ from her visa. And it is bound to happen. India is slated to overtake China as the world’s fastest growing economy and the signs are already there. The Indian government of the day wants to increase the share of manufacturing in its economy – from 16% to 22% by 2022. Now that is a lot and bound to have intense activity in the sector with the ‘Make In India’ initiative. The government and the activists, especially, the environmental activists, will cross ways regularly. Greenpeace India comes in this category. And Greenpeace India is facing survival crisis while writing this, as already mentioned. The government came with an order that was to affect the whole organization, and not just some campaigners. On April 9, government froze Greenpeace’s bank accounts and suspended its FCRA registration (Foreign Contribution Regulation Act) on ‘violating norms’ that Greenpeace says are unfounded allegations. 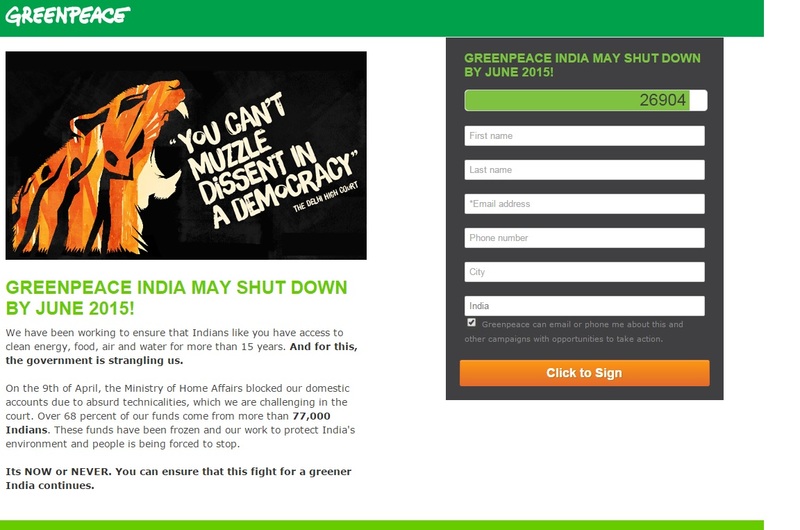 On May 8, Greenpeace India submitted its response to the MHA, rebutting point by point its accusations. They say they have not violated norms and the MHA notice has many clerical errors and is totally unfounded. Let’s see what happens next. Like Priya Pillai’s case, Indian courts are always accessible for an organization like Greenpeace. And if the MHA doesn’t act on it, we should hear from Greenpeace from the courtroom for sure, for they ‘refuse to be intimidated by dirty tricks’. NEPAL EARTHQUAKE: 10 DAYS ON..
— The extent of damage remains vague, based on the assessment so far. It will take a long time as some 14 cities are badly affected from April 25 earthquake. The United Nations says of 11 cities with overall projection of 39 cities and 8 million people. While assessing the scale of destruction, Nepal will simultaneously have to engage in rehabilitation and reconstruction work. — Different estimates vary from US$ 2 billion to US$ 10 billion but real extent of damage could come out to be even higher, straining Nepal’s economy that is just around US$ 20 billion. The Nepali government has reassessed its extent of damage, from US$ 2 billion to US$ 10 billion, but it is still a conservative one. — Some impendent experts accuse Nepal government of ignorance. According to them, the final death-toll could be around 30,000. A Swiss expert even projects it to be around 100,000. Whatever be the final figures, they are likely, logically likely, to be much higher than the figures quoted by the ministers and spokespersons of Nepal. — 34 countries that were involved in search, rescue and relief operations in Nepal have been asked to leave. Of the 75 teams, half have left Nepal by this evening. Overall, over 4000 aid workers were engaged in Nepal with India having the largest contingent. According to a report by the Hindustan Times, 962 aid workers were sent by India followed by China’s 370 and Israel’s 286. The same report says of around 700 foreign medical workers in Nepal. — India has led by setting example. There was round the clock overage of Nepal’s earthquake and Indian efforts in the aftermath. Of all the expert personnel there, National Disaster Response Force had the largest group. Naturally, Indian media highlighted Indian efforts there. Some saw it as ‘glorification’ of a crisis. So, at a time, when rehabilitation and reconstruction should be on the mind, Nepal has asked all the countries involved in rescue efforts to leave Nepal. — This order comes by a government that had expressed its inability on the very day of the disaster that it would not be able to meet the needs of the aftermath of this devastating earthquake, the biggest one in 81 years, after the Nepal-Bihar earthquake of 1934. — After 10 days, there are no hopes of finding survivors anymore. Yes, some miracles, like have been happening, my happen, but overall, it’s about reconstructing the affected regions now. — Nepal”s weak political system that is learning to stand on its own is preparing for the ‘relief stage’ now, the next phase. They have to rehabilitate millions, some 8 million out Nepal’s total population of 28 million, and it is to be done on war-scale. Now, what commitment they shows only time can tell. — Monsoon is approaching. Regular rains are few weeks away. Nepal have to remove tons of rubble, form its urban areas and its towns and villages. Machinery and equipments are needed and Nepal has appealed for the same and India is sending its team. — Nepal will be tasted here. It has to start the rebuilding process amid allegations of corruption, partiality and insensitivity in relief distribution. Nepal has appealed for relief teams and foreign workers engaged in relief operations can continue to stay. India is sending an engineering team with equipments to clear the rubble. Hope ‘Nepal asking the rescue teams to leave its soil’ was in good faith and the help will continue. — A peace prayer was also organized in Kathmandu, in Swyambunath temple. Some of the Buddhist stupas surrounding the 5th Century temple are damaged in the earthquake. People gathered there to pray for Nepal and pray for the humanity that is having difficult time there. — That brings an effective end to climbing season this year, which is till May. Though the Nepal government has said it will clear the southern route for climbers by the next week, it is clear that Sherpas are not buying it. Last year also, Nepal had to close the climbing season early due to an avalanche that had killed 16 Sherpas. China has already blocked the northern route from Tibet. So far, around 20 bodies have been rescued from the Everest base camp area and scores are still missing. — According to the same report, officials figures say, so far, 153,000 buildings are devastated and 170,000 have suffered severe damage. And the surveys have not yet reached the rural areas. — Nepal continues to face aftershocks. People still prefer living outdoor than going back to their homes, if they are at all habitable. And it goes with the line that Kathmandu look like a refugee camp bustling with people, the victims and aid workers and the whole of the affected region looks like having ghost towns. — On the 9th day of April 25 earthquake, the official death toll crossed 7000 mark. The injured count has already crossed 14000 mark. — A Swiss expert today said the death toll would reach around 26000. It can reach even 100,000. The expert called the Nepal ministers ignorant. — Given the extent of damage so far and the severity of the quake, the figures quoted by the Swiss expert look within limits. — The final figures, of dead, of injured, of displaced and homeless, are expected to be much higher than what we hear now. Dead and injured would run in many thousands and much higher. Displaced and homeless would be in millions. — Its nine days already but there are remote towns and villages where relief is yet to reach. Bad weather, rains, poor infrastructure and a downed connectivity through roads and communication means are hampering relief work and delaying the aid teams’ access to such areas. — Though there are no hopes of survivors now, miraculous stories of survival are still there, like three were pulled out of rubble alive after surviving eight days there or a 101-year old man was saved today. — According to the Nepal police, overall 54 foreigners are killed. 38 of them are Indians. 82 are still missing while 48 are injured. The figures look quite conservative given other estimates that say around 1000 Europeans are still missing in Nepal or estimates that say there were around 300,000 foreigners in Nepal when the quake struck. — The extent of damage would badly strain the impoverished nation. Nepal says, based on estimates so far, US$ 2 billion is needed. Independent experts including the experts talk of a much higher figure, around US$ 10 billion. The real cost of rehabilitation and reconstruction could be much higher than this. Moreover, it would be an act of coordinated efforts spread over the years. — Nepal is getting overwhelming support from the world community with India leading the pack. Its Operation Maitri is working day and night, right and within few hours of the earthquake, to help people and the country. Nothing can suffice the loss of human lives but what Nepal is getting in response is beating all expectations. And Nepal’s global goodwill is playing a good role in it. — Now, it is Nepal’s responsibility that it ensures uniformity in relief distribution. And that is not happening. People are complaining and protesting. They are clashing with Nepal’s officials for relief material. They allege that influential people are cornering the aid. They are also alleging that government is partial and insensitive. There are voices alleging that government is distributing aid to the families with dead members but is doing nothing for the families who have lost all but a family-member. A village just few Kms of Kathmandu has not received any aid so far even if no house is left there. — The cities lying on highways through Kathmandu, one to India, and one to China, wear a deserted look. They look like ghost towns. Aid is slowly reaching them but is not enough. — According to the United Nations, around 160,000 houses are completely gone and some 600,000 houses are significantly damaged. The UN says around 8 million people are affected from this earthquake and around 2 million immediately need food and water. UNICEF says around one million children need immediate assistance. The figures are bound to be higher than the UN estimates. — With Monsoon approaching fast, Nepal is staring at another epidemic, after this earthquake, i.e., the one induced by diseases. There are not enough hospitals for patients. Government has said of immediate disposal of dead-bodies from rubble. Compromised sanitation and hygiene practices in tents in Kathmandu and across Nepal are giving rise to stench and are in urgent need of cleaning acts. — Nepal continued to have aftershocks, avalanches and landslides. People continue to prefer open spaces. They are stressed and traumatized and continued aftershocks are forcing them to remain outside. — Nepal today closed its main runway for big jets that include military planes, cargo aircrafts and large commercial aircrafts carrying aid material after it found the runway having cracks. Only medium sized runways are allowed. But the UN said that the logistics situation has improved on an overall basis. — After the UN complained, Nepal eased customs duty on aid material. That have improved their availability (from till yesterday) to the intended population segments. — It’s over a week now, 8th day of a massive tragedy that struck Nepal, an impoverished nation that is counted among the least developed, killing around 7000 and injuring over 14000. Many remote areas are still unreachable. Houses in the worst affected regions are completely flattened. Scores are still missing and the final figure after search, rescue and relief operation is expected to be much higher. — According to a The Guardian report, Nepal’s customs laws are working as hindrance in the effective distribution of the relief material. Material is piled up at Tribhuvan airport but is not reaching the intended people. Nepal is pleading for food materials to be used for cooking, and not instant noodles and biscuits. It is also requesting the world community for tents and tarpaulin sheets which it made tax-free yesterday only. Responsible people of the Nepal government, who in the very beginning said that they would not be able to meet the needs after the disaster if the international help didn’t come, have, so far, failed to streamline the process of distribution. — Aftermath of the quake is one of the many inept responses of the Nepali government. Government apathy and administrative corruption allowed Kathmandu to be an unorganized mess. And now, such factors are in play even here. It is hard to believe when The Guardian reports that a village just 26 Kms west of Kathmandu, Chhatrepati (in Dhading district) is yet to receive the relief material. The Guardian quotes the residents of the village where every house if severely damaged in the earthquake. — While the international response has been overwhelming, many thousands of Nepalis are now a disgruntled lot. And that is because of the Nepal government only. Things needed for relief were to be exempted from the tax-regime of the country much ago, when the earthquake struck with a severe blow, but the ‘responsible’ people are still issuing advisories after being reminded of. — While there are no houses, families of the victims who lost their family-members in the earthquake are getting tents and tarpaulin sheets or priority basis. But the people who have lost all, except anyone from the family, are not getting the same treatment from the government. — Allegations of corruption and nepotism in relief work are increasing by the day. People with influential ties are cornering the relief material while many in the need are left behind. — Teams are yet to reach many mountainous reasons in the interior of Nepal. These places have seen some airdropping of relief material but earthquake has isolated such regions from the world, cutting road ties and snapping communication infrastructure. Even miraculous stories of survival would not be expected from such places after so many days. What we wish for is speedy rehabilitation and reconstruction process in universal terms, and not in Nepal’s ways. — In many districts, infrastructure of schools, hospitals and other basic civic amentias are so wiped out that reconstruction will take long and it is going to be a challenge for the administration to restart the comatose process. — Hospitals, health-centers and make-shift medical units are overflowing with people and there are valid fears of an epidemic, induced by different diseases. Kathmandu, that is expected to see maximum deaths in a single place due to its unorganized mess, looks like a big refugee camp of many small units. And stench of human faces and urine are common from these ‘small units’. — Government needs to acts fast on such valid concerns as Monsoon rains are just around the corner. Government also needs to factor in the psychological well-being of the people while requesting them to move to normalcy. They are traumatized and continued aftershocks have made them believe that returning to their houses will take long, probably after Monsoon. According to the UNICEF, the government has ‘a small window of time for rescuers to make arrangements to protect people from a disease-induced epidemic’. — Nepal continued to have tremors of aftershocks today, like every other day. It is scientifically projected that Nepal would continue to feel aftershocks for months to come. Two aftershocks recorded today were of 5.1 and 4.5 in magnitude. — Along with aftershocks and bad weather, that also includes rains, landslides and avalanches are further hampering the R&R work, especially in rural areas. — Death toll in Nepal is nearing 6,500 while there are around 15000 injured. We can assess so given the confirmed official figures for dead and injured are 6,250 and 14,357 respectively. Like earlier said, it does not include many in remote towns and villages where aid is either trickling down or has not reached at all. — The final figures, which will take time, are expected to be in many thousands and much larger than what we are talking now. In 1934 earthquake in Nepal-Bihar, from which Nepal learnt no lessons, there were very few people in the valley around Kathmandu, and even in Kathmandu. Then, Nepal did not have a global tourist attraction in the form of Mount Everest and the regions around it for trekking and climbing. That has changed in 2015. Kathmandu, along with its valley is an unorganized mess of people and constructions. — Mount Everest and nearby areas around it are expected to be opened next week for climbing and trekking. China has closed the northern way up for this climbing season. Let’s see if the climbers return. If that happens, that would be a precious source of earning for Nepal in these circumstances. — So far, around 19 bodies of climbers and sherpas have been recovered. Many have been rescued from Mount Everest area. Scores are still missing. — The United Nations said just US$ 53 million out of its appealed US$ 415 million were collected till Friday. It is worrisome. Though Nepal is said to getting overwhelming international support with India leading the search, rescue and relief missions, the world needs to do more for this impoverished nation that has seen a prolonged monarchy and a protracted Maoist struggle. The democratic Nepal was just beginning is to take steps when the devastating earthquake happened. — According to the UN estimates, around 3 million immediately need food and water. Overall, around 8 million people are affected. Some 70,000 houses are gone and around 600,000 have suffered extensive damage. — According to its official estimates, that is preliminary in nature and is bound to go up, Nepal needs US$ 2 billion for rehabilitation and reconstruction work. The extent of damage goes up to US$ 10 billion according to the US Geological Survey, around half of Nepal’s annual GDP. — It has to be an extensive process, spread over the years, and much depends on how Nepal mobilizes the international support and how it exploits the internal rescores available in the years to come. — At the time of the 7.8 earthquake on April 24, some 300,000 foreign tourists including Indians were in Nepal. Many have been evacuated. Many are waiting. Many are still missing. The European Union said today that around 1000 Europeans are still missing in Nepal. — India has so far evacuated around 15000 through air and road-routes via Uttar Pradesh, Bihar and Uttarakhand. It has helped other countries as well, evacuating nationals of some 14 countries and issuing them free visa. — India cleared today it was there in Nepal with its full force but was acting secondary to Nepal. Nepal was leading the rescue and relief operations. India is helping Nepal as a big, watchful brother with its disaster experts and relief personnel, even if it rains. — India’s Foreign Secretary S. Jaishankar and its National Security Advisor Ajit Doval were in Nepal today. They took stock of the situation about R&R operations. They also made an aerial survey of the most damaged area. — Nepal has its granaries full, as its minster says. But there are no people to take trucks to remote towns and villages. They have gone back to help their families in this disaster and the government is facing a cumbersome task. There are protests and clashes on delay of R&R operations in areas where aid is not reaching. — Most of the people staying outside continue to do so. Kathmandu looks like a refugee camps these days. And it is expected to be so till the Monsoon rains arrive. People are expected to persist even in that. Morgues are full and the government has ordered immediate cremation of bodies. Affected regions look like ghost towns with relief material where only airdropping is possible and with personnel and relief material where people can reach anyhow. — On seventh day of the devastating earthquake of April 24, measuring 7.8 in intensity, the death toll is nearing 6000 while the injured count has crossed 11000 mark. Nepal army chief feared death toll could be as high as 15000. The final figure, or around it, will take days to arrive at and it is expected to be in many thousands. — And it not just about dead and injured. Millions are left homes, displaced staying in outdoors, children alike. Many families are wiped out. Many families have family-members lost. Many families have very few or single survivors. According to the UN, some 70,000 houses are destroyed while 530,000 have suffered heavy structural damage. — Whole of Kathmandu is looking like a refugee camp. It is dotted with tents. Teams of disaster management personnel, security apparatus, government officials, aid workers and people of Kathmandu have the combined responsibility of maintaining sanitation and hygiene. According to reports, they are failing in this because of government and because of people. Smell of human faeces and urine can be felt around relief camps of Kathmandu. — Whole of Kathmandu valley and the affected regions of Nepal look like ghost towns. Quake epicentre in Gorkha district is totally vanished. No house is left in Barpak. There are many villages in the interior of Nepal where help is yet to reach. And whenever the aid teams reach there, their functionality would be basically about relief efforts as they would have no one to rescue anymore. Apart from some miraculous stories of survival, all would be dead by then. — UN says 1.8 million immediately need food and water assistance. It estimates around 8 million are affected across 39 districts. 11 of it are considered severely damaged in the quake of April 24 and tremors and aftershocks after it. UN has appealed to the world community for an immediate relief of $US 415 million. — People are protesting. Earthquake victims are clashing with police and government officials. They have no food. They have no water. The home looks frightening to the majority living out in the streets even if there is a home. Sheer frustration is leading them to block roads and relief operations blaming government of apathy and delay. — Roads are hit with splits and cracks. Many bridges are gone. Choppers are not finding place to land in worst affected villages and remote towns and are airdropping relief materials. According to some reports, such areas need a trek of five days to reach there. The UN quotes ‘significant logistical challenges’ in reaching out to such rural areas. — Nepal will have to work in different ways in different areas. The areas with relief camps need to see efforts towards rehabilitation and reconstruction now as Monsoon is near. The areas not yet reached need aid teams and relief work. Reaching there and providing relief should be the priority of aid teams. The UN said – Some villages can only be reached by foot with some areas taking up to four to five days to reach. Fuel to transport SAR teams (search and rescue) is limited. There is a need to prioritise restoration of communications infrastructure, casualty management and basic relief in remote areas. — Nepal had three aftershocks today, two of them measuring 3.9 and 4.7. Nepal is expected to have aftershocks for months. — Being a rainy day, rains hampered rescue and relief operations today. — India is at the forefront of R&R operations in affected regions. Prime Minister Narendra Modi and senior ministers and officials are personally looking after the work being done there. They are holding regular meetings. India’s Foreign Secretary S. Jaishankar and National Security Advisor Ajit Doval are scheduled to visit Nepal tomorrow. — Nepal government appealed its people to start their lives again. It has asked its employees to come to offices. Workers are told to engage in rehabilitation efforts along with day to day activity. Some shops, restaurants and casinos are opening up. Government has told shopkeepers to return to business. Banks are operating in Kathmandu. Government is working to reopen schools. — According to a report by the Associated Press, Nepal may allow Himalayan trekking and climbing to Mount Everest if climbers do so. The report says that the climbing season may be extended to June. Traditionally, bad weather makes it difficult to ascend the world’s highest peak beyond May. — 19 are confirmed dead here, in Everest base camp area and on the way up. Scores are missing. China has closed the northern route to the peak for Spring. The southern route from Nepal, badly damaged in the earthquake, is the popular one. According to the AP report, Nepal will be able to open it up within a week. — China did not use its military planes to evacuate stranded Chinese. Also, India has outdone China in evacuating its nationals. Chinese PLA is being criticised for it. — Countries have continued evacuation of their stranded nationals. So far, India has helped 15 countries in evacuating its nationals. They are being evacuated through Tribhuvan international airport in Kathmandu and through road-routes via India. Many thousand Indians are still trapped in Nepal, a religious and historical country for Hinduism. — Those dying in April 24 earthquake and aftershocks and tremors that have followed have crossed 5200 mark. It is expected to be around 5500 so far. Around 11000 are injured. Millions are left homeless and displaced. — There are stories of survival and there are stories of despair. Hope they show it, but they don’t possess it. Their homes are gone. Their loved ones are gone. Some of them have survived the earthquake trapped in the rubble for four days, rubble that happened to be their houses once. — Though there are miraculous stories of survival, like a man in Kathmandu who was pulled out of rubble after 82 hours, or like a four-month old baby in Bhaktapur who was rescued after 22 hours, but overall, affected regions of Nepal have turned into ghost towns. — India is basing its operations in Kathmandu and Gorkha districts – the two most affected parts – in terms of human lives and destruction. The 7.8 quake’s epicentre was in Gorkha district, between Kathmandu and Pokhara, near Lamjung district. — People are complaining that they have not received the relief material. They are complaining about the slow pace of delivery. They are behaving frustrated and irritated. They are running out of patience. They are protesting and some of them even blocked the traffic in Kathmandu to press for their demands. They are demanding water and food. — People continue to stay outdoors in affected areas including Kathmandu. Aftershocks have continued. No major tremors in last two days. No major tremor today so far. — The by-product practices in such circumstance like people selling their assets and properties for relief materials including food, water, medicines and possibly shelter, people looking to buy such things, goons indulged in loot and burglary and rumour-mongering are also having a run in the affected regions of Nepal these days. — Today, banks in Kathmandu worked for few hours. ATM kiosks received the much needed money infusion. People running short of everything can breathe easy on this front – yes, only if they are carrying their cards. And yes, this is limited to Kathmandu only. — Everest climbing season of Spring has virtually come to an end. China has closed the northern way from its side, from Tibet. No one knows when would it be reopened. The route from the southern side, the popular one, one in Nepal, is completely devastated in the quake. Bodies of around 20 climbers has been recovered so far. Scores are still missing. Scores are left injured.